CM Magazine:Final Faceoff. (Looney Bay All Stars; 7). Final Faceoff. (Looney Bay All Stars; 7). Helaine Becker. Illustrated by Sampar. 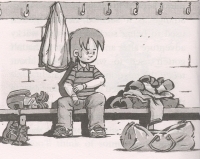 Toronto, ON: Scholastic Canada, 2008. "That was awesome," Darren said. "Doesn't it seem like ages since we played a normal game like that, without any uninvited guests to mess things up?" Reese smiled. Darren was right. It had been ages. During the past crazy year, the only game in town had been coping with mysterious visitors in Looney Bay. The cause of all the trouble was a magic golden coin Reese had found at that same rink almost one year ago. Whenever Reese rubbed the coin, people from other times appeared! Vikings, knights, gladiators, pirates and explorers had all shown up at one time or another. When time travelers appeared, Reese and his pals wound up in some seriously sticky situations---even once in a battle to the death! Final Faceoff is the seventh installment of the fast-paced, action-packed novels written for young readers by award-winning author Helaine Becker. Each of the first six episodes focuses on different historical characters who make the trip to Looney Bay in modern-day Newfoundland. Each feisty character has some significance to Canadian history. The twist of this series is that the time travelers take up residence in Looney Bay, and the author adeptly intertwines them in subsequent adventures. One year has passed since an Egyptian Pharaoh appeared. The magical coin foreshadows which historical figure will appear next. This time, when Reese inadvertently rubs the coin, Queen Elizabeth I appears in search of Sir Frances Drake. Coincidentally, Drake is the same figure who is the focus of Darren's social studies project. Instead of reading about him in a flat history text, Darren and the rest of the kids from Looney Bay are getting a hands-on history lesson. The Queen recruits Sir Waverly and Sir Hugh, knights from episode #2, Attack by Knight and, along with the pirates from the first episode, Pirate Power Play!, they join Drake to battle the Spanish army. Drake teams up with fellow privateer and naval commander Martin Frobisher to fight the Duke of Medina Sedonia. Reese, who tries throughout the Looney Bay series to convince the violent men from history to resolve their differences peacefully, invites the Spanish Armada ashore. "How about this, Dukie: Come ashore and see for yourself. If you still think you're in England, come back to your ship and we'll battle it out. But if you think you're in Canada, we'll come up with a better way to settle the problems between you and Queen Elizabeth. A Canadian way." Reese's version of peaceful conflict resolution is a battle of skill through an athletic competition. 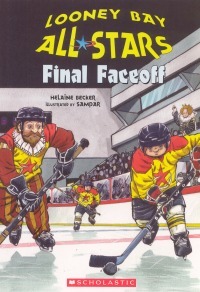 In other installments of the series, the boys and girls on Reese's team have shown the time travelers how to resolve their differences by playing lacrosse, track and field, soccer, baseball, and basketball. As in #1, Pirate Power Play! this time the young Looney Bay All Stars play a game of hockey. Reese, Darren, and the All Stars help the Queen win over the Spaniards 8 -- 7 in a tie-breaking shoot-out. After the game, Queen Elizabeth I and her men wish to travel back in time to England, but the Spanish Duke and his army prefer to stay so that they may fish and play soccer. Subtly connecting to recent events in Newfoundland's history with fishing off the Grand Banks, the Duke promises that his 3 000 sailors are "Good fishermen, who take care of the sea." The Spaniards perceive that life is much better for them in modern-day Canada as opposed to historical Spain. Darren feels that Looney Bay is already too full of time-travelers, but Reese explains that Canada is built on the foundation of immigration. "Canada's almost always welcomed immigrants. That's what makes us such a great country." Reese proceeds to recount that, in all their encounters with the historical figures, the Canadian children have taught them to get along with each other instead of being crude and violent. As Reese tries to figure out a way to send the Queen back, she touches the magical coin and they disappear. But the coin also changes---into a Loonie! It has a Common Loon on one side and Queen Elizabeth II on the other. Reese, feeling that they no longer need the magic coin to keep peace in Looney Bay, drops it like a puck onto centre ice at the arena. Reminiscent of the 2002 Winter Olympics when the Canadian icemaker buried the Loonie under centre ice, the coin magically melts into ice and disappears. Not only does author Helaine Becker intertwine past and recent Canadian and Newfoundland history into the text, but the title of the series "Looney Bay" is linked to the dollar coin and Canada's official bird. With the magical coin gone and given the title of the book, Final Faceoff, the reader might think that this is the last installment of the series. Instead of going on and on with more and more books, perhaps the author is choosing to complete the time-travel series and have it as a seven book set. Only time will tell. The series, itself, should be a welcome addition to any elementary school or classroom library. There is fast-paced adventure, Canadian content, and historical figures that will entertain readers and reassure concerned parents and teachers that children are learning as they read. Stacie Edgar teaches in the Winnipeg School Division and loves to share her knowledge of sports trivia with her children and students.